In Japan, “Hosoge” generally refers to a fancy flowery pattern which was often featured in Oriental art produced from the 7th to the 12th century. For those who imagine that this term, “Hosoge” has a long history in Japan, it might be a surprising fact that it was only in 1889, in the 3rd edition of an art research magazine named “Kokka,” that the term appeared for the first time. There, “Hosoge” was used to describe the flowery pattern made with mother-of-pearl inlay on the suquare canopy of the Phoenix Hall. From this time on, “Hosoge” became familiar in Japan as a generic term for a fancy flowery pattern. 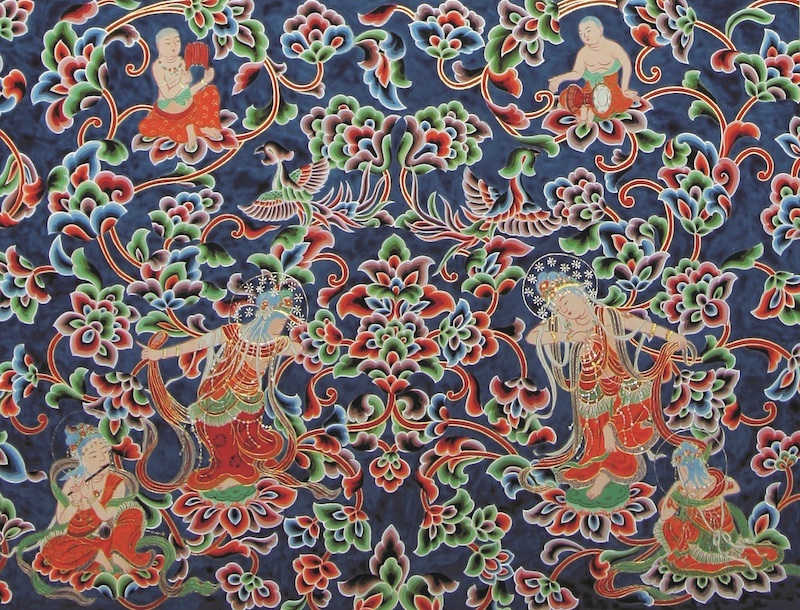 Curiously, no one has tried to discover why those fancy flowery patterns were often preferred in Oriental art for so long. The Phoenix Hall was built with the people’s hope to recreate the Amida Buddha’s Pure Land in this world. The interior of the Phoenix Hall is gorgeously decorated with both the Hosoge and the lotus patterns. Both correspond to the typical adornment featuring plants referred to in important Buddhist sutras telling about the scenes of the Amida Buddha’s Pure Land. That is to say, the Hosoge and lotus patterns inside of the Phoenix Hall adorn the hall as a representation of the Buddhist Pure Land where Amida Buddha is believed to live. This special exhibition introduces imaginary flowers which are believed to inhabit the Amida Buddha’s Pure Land through the decorations found inside the Phoenix Hall. *Open every day during the exhibition period. Some of the exhibited items will be replaced during this time. Admission: Admission fee for Byodoin Temple will be required.